In the first instance, please contact us via the Inquiries page. We will send you a list of fields in which we have translation experience - you are sure to find the field you are looking for. Adept Corporation is a translation company with experience in a wide range of industrial and technical fields. We provide a service that balances the three key considerations of quality, cost and deadline. Specialist translators, editors and proofreaders in each field ensure a high quality of finished translation. To meet your translation needs, we are able to call on more than 200 highly experienced translators whose specialties cover a wide range of industrial and technical fields. We don't just produce accurate translations using appropriate terminology, we produce marketing resources that are ready to be used. We also undertake software localization - a service that calls for specialist technical knowledge as well as a high level of translation skill. So that you can see the quality of Adept's translation work for yourself, we offer a free trial translation service. 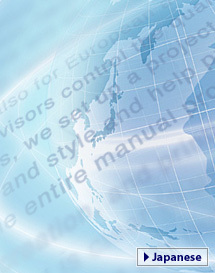 Please use our trial translation service to sample the quality of Adept's work for yourself. We are confident that you will find the service we provide to your satisfaction.